As the story goes, Dean was in Florida with his co-workers from his company, Erie Blacktop, Inc. 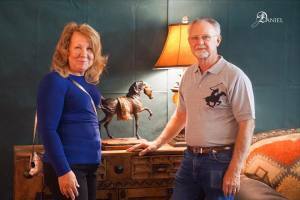 The group debated over going to an antique auction or visiting a horse farm. While the antique auction was quite tempting, the group drove to Free Spirit Arabians, the horse farm. Dean discovered he had a love for Arabian horses that day. Though Dean only wanted to purchase two of the Arabians, he was offered the opportunity to purchase a herd of thirty horses. Eagerly, Dean accepted the offer! In 1991, Wikel Arabians was born. Our first stallion was Autumn Séance, a grey halter horse who won his first US National Championship in 1991. Séance went on to produce a bloodline of champions. Cazsandra and Autumn Tapestry are two daughters of his that continue to create sought after offspring. Armani FC, a bay Arabian stallion is the farm icon. He is currently retired from the show ring, but enjoys his retirement at our Ohio farm, being ridden lightly, enjoying trail rides, and getting lots of time in turnout. In 2008 they won Youth National Arabian Country English Champion and also the Reserve Champion. Armani FC has possessed incredible poise, soundness, performance and versatility for over a decade. Of Armani’s eight total Championships, half of them were National Championships. He has five Reserve Championships, three Top Five’s, and three Top Ten’s. Armani’s 140 progeny have also continued to win in different disciplines by winning Four National Championships. The proven results are impressive for Armani’s babies – 53 Championships, 37 Reserve Championships, 89 Top Ten, and hundreds of other wins and ribbons at the local level shows. In 2000, Dean imported his first Dutch Harness horse, Pauletta B from the Netherlands. Pauletta stood as the current In Hand National Champion at the time of purchase from Gene LaCroix. Pauletta B still remains a favorite on the farm, and has gone on to produce some incredible half-Arabians for us. The Netherlands 1999 National Champion & 2000 Reserve National Champion Dutch Harness Horse Stallion, Jonker, was the only Stallion Dean imported from the Netherlands. Jonker went on to produce many offspring and is loved by the Amish Community for his superior motion, strength from the hock, trainability, more bone, conformational correctness and temperament. It is the highest natural trotting horse in the world as a result of very selective breeding for over 100 years. Jonker and Unbelievable (Mano x Olga), complimented the breeding program to produce Champion English Saddle Seat Half Arabians out of Performance Arabian mares. Fourteen years ago, Dean purchased a horse trailer company in Minnesota called Pegasus Vans and Trailers. In 1998 he moved the company to the farm in Berlin Heights, Ohio. As the company grew, Dean relocated to a larger facility in Sandusky, Ohio. As a result, Wikel Arabians was changed to Pegasus Arabians. As we approach our twentieth anniversary, we are fortunate to have had both US and Canadian National Halter and Performance Champions, won many other Championships, and to have brought home thousands of ribbons. The Arabians are an investment of the heart. We love the breeding program of our operation and most of all, we love the beauty of the horses! Though many things have changed over the years, one thing still remains the same…as long as we are having fun, that’s all that matters!